Delta Zeta hosted Smooch-A-Pooch, a fundraiser for the organization's national philanthropy, the Starkey Hearing Foundation on Feb. 21. 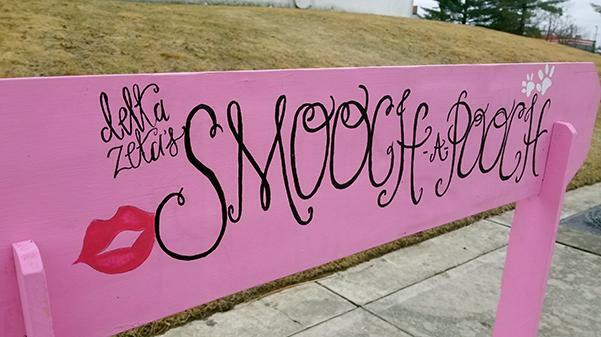 Students could pay $1 for one smooch or $5 for unlimited puppy kisses outside of the Spellmann Center. Delta Zeta hosted a unique event for its philanthropy organization, the Starkey Hearing Foundation. On Feb. 21, members of Delta Zeta brought their dogs to Lindenwood for a Smooch-A-Pooch fundraising event. Emily Miller (right) introduces a friend to her dogs Maisy and Riley as another dog, Oscar, sniffs around, wanting to join the party. Hatfield organized the event and said that the dogs belong to members of the organization. She brought her dog, Oscar, to give some kisses and play with students at the event. “The goal of today is to have fun with pups, to educate people on our philanthropies as well as raise some money for our cause,” she said. The dogs were outside of the Spellmann Center from 11 a.m. – 2 p.m. playing with students and posing at a photo booth. Fun fact: He loves sweaters that his owner Erika Hatfield picks out for him. Fun Fact: She loves attention, spending time with her owner Alyssa Robertson and will be turning 1-year-old in March. Fun Fact: He is calm and likes to play ball with his owner Anna Robertson. Fun Fact: Riley likes to play with her sister Maisy and is happy to be out at Smooch-A-Pooch with her owner Emily Miller.